HH Sheikh Hasher (centre) at the fair. HH Sheikh Hasher Bin Maktoum Al Maktoum, Director General of Dubai’s Department of Information, today opened the second edition of World Art Dubai, the region’s premier platform for affordable and accessible art, at the Dubai World Trade Centre. Running until April 9, the fair has grown considerably from last year’s inaugural edition. More than 140 local and international galleries and artists are onsite featuring a wide variety of artwork starting at just $100, highlighting World Art Dubai’s aim to provide art that is accessible and affordable to a wider community of people who are interested in contemporary art. A testament to the momentum of the contemporary art sector is its almost 20 per cent year-on-year growth, which is now valued at Dh21.7 billion ($5.9 billion) according to the TEFAF Art Market Report 2015. This sector is the largest of the global fine art market and represents 48 per cnet of all fine art sales by value. A VIP preview reception welcomed dozens of Dubai’s VIPs and influential art aficionados who had the chance to take in this year’s work of arts and enjoy a reception hosted by Coya, the Official Restaurant and VIP Preview Partner at World Art Dubai. A number of established and emerging artists and galleries from all over the world are making their debut at the fair while many prominent names have returned for the second edition of the show including Andakaluva Gallery, Cross Borders Art Gallery, Jade Flower, Nina Torres Fine Art, Anna Dudchenko, Petra Kaltenbach, Gallery KAG, and Charles Fazzino. As visitors browsed through the selection of art work on display, they also took part in engaging and informal conversations on a wide range of topics from information on the art market, transition to digital art, alternatives in art and a step by step approach to building an art collection. The Art Talks programme, presented by Digital Art Partner Microsoft, runs throughout the four-day fair as well as a Surface Digital Art Wall featured inside the Red Dot Lounge on the show floor. Microsoft brought in Ashraf Ghori, an award-winning artist and filmmaker, CEO of Dubai-based digital design agency Xpanse CGI and Senior Digital Art Consultant for Bayyinah TV who delivered a talk on the first day about the transition to digital art. 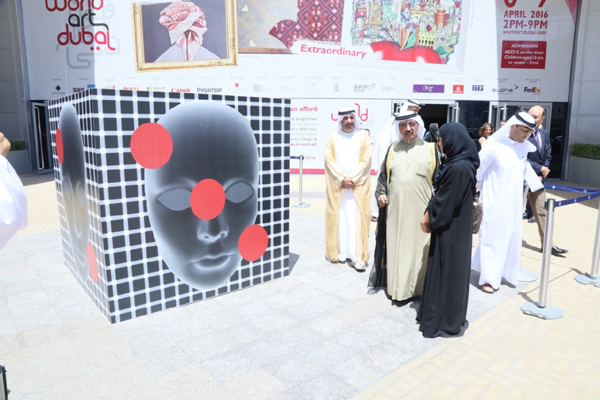 Other highlights at the show offered both adult and children visitors a hands-on experience to unleash their creativity and to learn about the basic elements of art through educational workshops centered on the theme of ‘Breaking Cultural Boundaries through Art’. In the outdoor area, @The Yard featured food trucks, the Canon Activity Wall and Repton School’s Urban Dubai competition as well as an area for visitors to express themselves with paint on canvas. An Activity Wall set up by Canon, the Official Imaging Partner, gave visitors the opportunity to be part of ‘the bigger picture’ by uploading their pictures on Instagram using the hashtag #mygraffitiart. The wall then uses these pictures to make up the pixels of a larger image, allowing visitors to literally become part of a work of art. Features running throughout the fair include painting demonstrations such as a live feet painting activation by award-winning artist, Zahirah Muthy, taking place tomorrow (April 7) from 6:00 pm to 7:00 pm, and busker style musicians will be onsite daily from 5:00 pm to 9:00 pm to create a lively atmosphere both indoors and outdoors using various musical instruments. Trixie LohMirmand, senior vice president, exhibitions and events management, DWTC, said: “We are so pleased with the positive response World Art Dubai has received so far.